#JusJoJan … argh! What happened to my hair? I don’t know about anyone else, but get so knicker-knotted at the thought of letting someone else cut my hair instead of my usual hairdresser. Will they leave my mane in a mess? Will they understand what I mean when I say I’m growing it so leave the length as it is? I found out yesterday afternoon. I knew my usual lady would be away on leave for the whole of January. I hope she’s enjoying herself exploring the wonders of Australia. Ordinarily I would have waited for her return but that would mean I would resemble an Old English Sheepdog. We decided to book me in with one of her colleagues to tide me over. I’ve been growing my hair for over a year now. It had just reached the stage where I was happy with the length, versatile enough to wear it up or down. So, with heart hammering, I explained to the interim scissor-wielder, that I wanted to keep the length, just trim off the ends, and tidy up the layers. She set about my hair with great efficiency. An hour later I am done, inspecting the back of my head and nodding. Inside I’m thinking she’s done quite a good job considering she doesn’t know me or my hair. I admit I was in a rush to leave as I needed to eat before heading off again for evening dance classes (I’ll tell you about the classes at some point soon). This morning, now that I’ve had time to slow down and take a good look, I feel a certain amount of aggravation. What happened to the length? I am missing a good two inches off the length! I remember a saying appropriate for my current coiffure – “What’s the difference between and good haircut and a bad one? About 6 weeks!”. I fear, in my shorn case, it may be more like 6 months! Why not entertain yourself further and pop over to Fandango’s blog, supplier of today’s prompt. 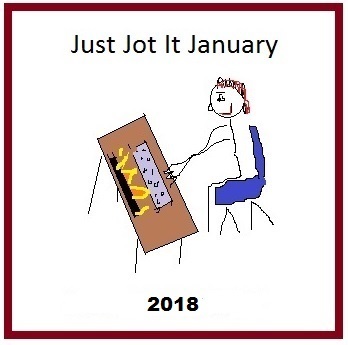 Next post#SoCS #JusJoJan – suitable reading material.